Foley Gallery is pleased to announce Purfle, an exhibition of sculpture by artists Cal Lane and Elissa Levy. 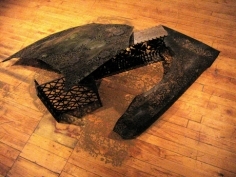 Levy will be presenting new cut felt sculptures with military themes and Lane will be presenting plasma cut steel car parts, I-beams, tools and a dumpster. As female artists, Lane and Levy implement a gender role reversal in their work. 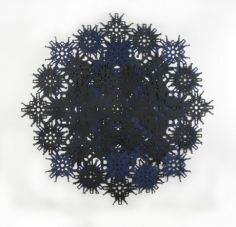 Levy chooses felt, a soft and pliable material, to create work which deals with aggressive military imagery, while maintating a gentle doily-like construction. Lane uses more masculine identified steel to make something elegant and dainty. The delicate and decorative physical qualities of these pieces contrast with their overwhelming association with masculinity and industry. The result is a collection of works that are paradoxical yet logical. By combining domestic and industrial imagery and objects, Cal Lane breaks down function by exposing visual patterns. 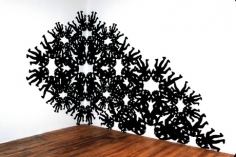 Lane uses decorative patterns such as lace and applies it to an object that is designed solely for function. This item, which was once strictly utilitarian, loses its purpose entirely and becomes something that can only be displayed as a beautiful object. The intricate felt sculptures that Elissa Levy creates are formed by store-bought craft stencils that are in the form of soldiers. These mass-produced toys are intended for children, but reflect an adult nostalgia. In their simplicity, aggressive and sexual qualities are removed, despite their presence in reality. 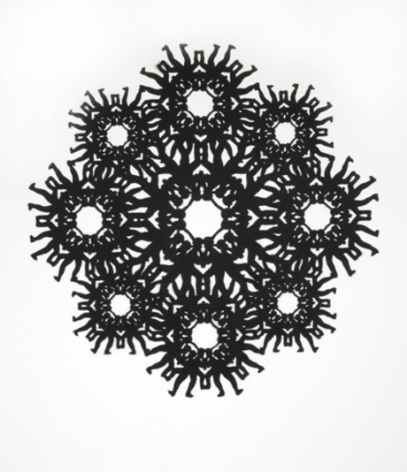 Levy uses black felt to retain the crafty feeling of the original stencil, but transforms it into something that echoes other decorative arts. 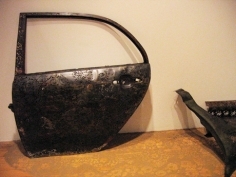 Cal Lane has trained as a welder and an artist. She received her MFA from SUNY Purchase. 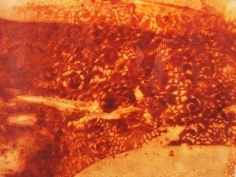 Her work has been featured at the Stay Gold Gallery in Brooklyn, New York and she is currently exhibiting as a recipient of the 2006 Emerging Artists Fellowship at the Socrates Sculpture Park in Long Island City, New York. 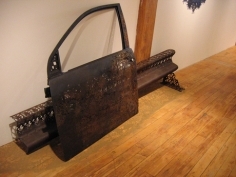 Elissa Levy received her degree from Rhode Island School of Design in 1993 after studying in the United States, Paris, and Mexico. She has had solo exhibitions at Brooklyn Fireproof Inc. in Brooklyn, New York as well as the Living Room in San Francisco. 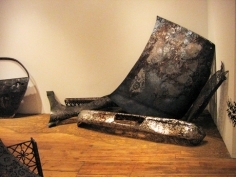 Her work has been included in group exhibitons at the New Museum of Contemporary Art and White Columns, both in New York City.